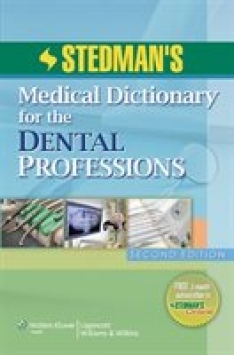 Be it dentistry, dental assisting, or dental hygiene, Stedman”s Medical Dictionary for the Dental Professions, Second Edition is the go-to resource for all students and professionals in the dental field. This dictionary contains definitions for nearly 16,000 terms relevant to all dental professions, including dentistry, and includes more than 500 illustrations-most in full color-and a glossy full-color oral conditions and disorders insert. Appendices include tooth numbering systems; dental imaging errors; guidelines for infection control in dental health care settings; weights and measures; medical prefixes, suffixes, and combining forms; medical and dental abbreviations; abbreviations used in medication orders; laboratory reference range values; and professional organizations. Also included with the purchase is a free three-month subscription to Stedman”s Online: Stedman”s Medical Dicationary for the Dental Professions, which includes all the content from the print dictionary, as well as access to 5,600 images, more than 8,500 audio pronunciations, 42 live action videos, and a customizable section, My Stedman”s, which allows users to add terms, add notes, add definitions, save searches and illustrations, and include outside links.